The annual Civil War hybrid project in the 8th-grade photography arts program rotation is a fun mix of history and technology. 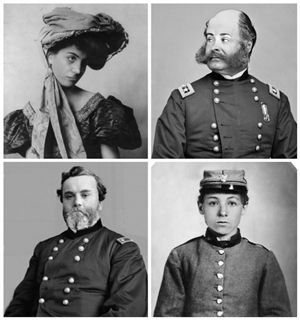 Students select American photo portraits from the 1860's and then carefully shoot digital images of themselves to mimic the portraits' lighting, angles and poses. Using layers and masking in Photoshop, students then merge their faces with the old portraits to create a seamless hybrid. The finishing touch for the project is a creative writing piece: an original, fictional journal entry from the point of view of the portrait subject.